Understanding what our galaxy looks like is difficult as it is like making a drawing of your house if you have only ever been on the inside and never seen it from outside. We notice a few things from other galaxies that give us clues. There is a plane, or disc about 1,500 light years thick. There are spiral arms that make up this plane. The plane from one end to another is between 100,000 to 150,000 light years across. Also there is a central bulge in the centre. This is in the region of Sagittarius, but we cannot see it very well because there is a lot of cosmic dust in the way. 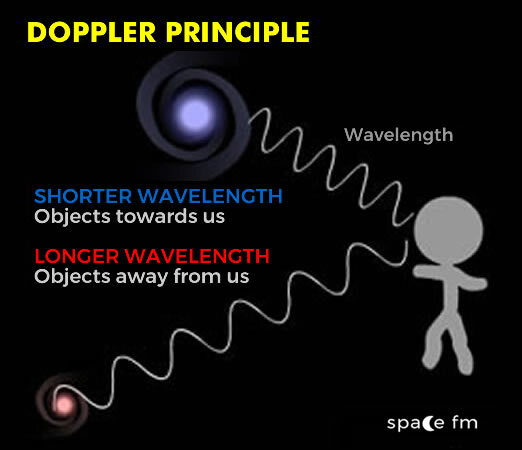 We can however detect it with infrared and radio signals. At its centre is believed to be a supermassive black hole called Sagittarius A which is a source of immense radiation which we can detect. The Sun is around 30,000 light years from the centre of the Milky Way. This is about two-thirds of the way from the centre, along one of the spiral arms. Like the planets orbiting the Sun, the Sun in turn orbits the centre of the Milky Way along a spiral arm. It takes 226 million years to make a galactic orbit. The Sun is positioned on a spiral arm called the Orion Arm. Dust: Dark bands between the solar system and the centre of the galaxy are caused by dust clouds known as the great rift. Spiral arms contain a large amount of interstellar gas and dust. Globular clusters: These are the oldest objects in the milky way and surround the halo - the dusty area around the galaxy. Star clusters are positioned near the arms. Star formation: Takes place in the disk and spiral arms as gas and dust is dense and cool enough to form stars. It is more accurate to study the rotation of our galaxy by radio waves because we can only see part of the sky with visible light. The 21cm (centimetre) range is known as the Hydrogen line which allows us to see past clouds of interstellar cosmic gas and dust. The centre of the galaxy has a lot of this. It has told us the structure and rotation of the galaxy. 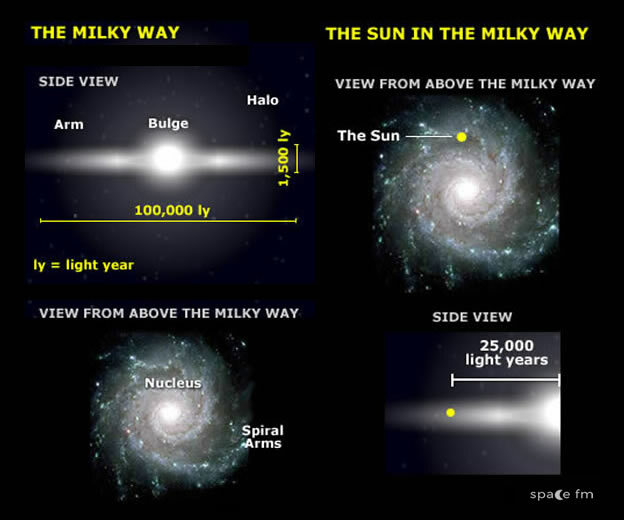 The Milky Way is an Sb (Spiral barred) galaxy. Until recently it was considered a spiral galaxy. Why do we use 21cm radio wavelengths to measure the galaxy’s rotation? How long does it take for the Sun to orbit our galaxy? Assuming the Sun is 5 billion years old, how many orbits has it made in its lifetime? Describe the type of galaxy the Milky Way is. What is the width of the Milky Way in light years? What is its height along the plane? What is thought to be at its centre? Where are star and globular clusters positioned with respect to our galaxy?